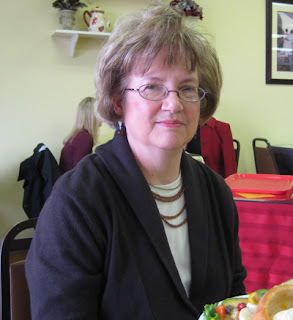 Today my mom had a doctor's appointment in my town so she came early and we went to lunch together. Her doctor is in the same office park as my office. I took her to one of my favorite's - Crumpet Tea Room. 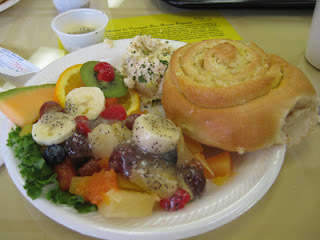 We had chicken salad, fruit with poppy seed dressing and a delicious orange roll. So yummy! The other big news in our house is that Scott got a new job. He starts on Monday. 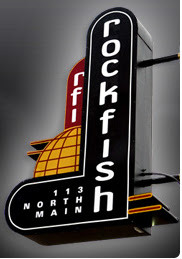 He will be working for Rockfish interactive. It's a great move for him and he will be working with several guys he has worked with before at two different companies. The best part is that he will only be working about a mile from our house (versus 30 miles away). I think he will be very happy at this job which makes me very happy! God has blessed us once again! We have a very low key weekend ahead of us and I am so looking forward to it! That food looks good. I love chicken salad. Yea! A new post! I was anxiously awaiting...although you did kind of ruin it for me when you told me what you were going to share! ha! J/K. The delicious lunch was enough to spark my interest. Laurie would have LOVED that lunch. I'm sure she's sad she missed it! YUMMY! I LOVE the Crumpet Tea Room! That poppy seed dressing is a personal favorite! I hope you guys are doing well and I hope you had a Merry Christmas! Whoa for Scott! Have a great weekend! Congrats to your hubby! How exciting to start the new year with a new adventure! Your lunch looked yummy too! Now I'm hungry! LOL But instead I'm off to finish cleaning closets! Yea for the new job! I love low key weekends...how I wish we had more. Maybe we can make that a resolution? I love your new background! Very You! I know it was fun to have lunch with your Mom, but I would NOT have been excited about the chicken salad, We are so happy for Scott! I took one look at that food and new exactly where it came from. I am craving it now. I have not eaten there in years! I love that place. I may have to make a trip over. :) Are they still in the same location? I'm sure Chad can inform me. :) Yeah for Scott's new job. That is awesome!! Congrats on the good news. There's a place in Mt. Pleasant which is about 22 miles from here called Our Special Touch. We call it the tea room. They have stuff like this, also the best sandwiches, soup, and pies around. You've made me hungry. I'll have to be going to Mt. Pleasant soon. Hope this year holds much, much more good news for you! I LOVE crumpet tea room!! My MIL takes us there sometimes when we are in town...SO good! Congrats on the new job for your husband! Hummm...crumpet tea room...another Arkansas dining destination! Thanks for the tip! I'm so excited about your Hubs new job. Just think of all the money he'll save on gas!